The first text in Greek devoted entirely to India was written by Ctesias in the fourth century BC. Only fragments of it survive. Yet he was probably the most widely quoted author on India, although Aristotletreated him with contempt. However, soon after Aristotle drew upon Ctesias’ writings, as did Plato,Xenophon and Plutarch. From all these account India became a happy land, a kind of utopia. Pliny (AD 24-79) put forth the age-old notion that India covered one-third of the surface of the earth. Indian kings from Father Tiber to Alexander had reigned 6451 years and three months. Anaximander of Miletus, born in 610 BC, was the first Greek to draw a map of the earth. It was shown there that the earth was shaped like two half moons of land. The one on the north was Europe and the southern one consisted of Asia and Africa. Together these two half moons enclosed an inland sea – theMediterranean, truly meaning the middle (medi) of the land (terra). Herodotus drew upon such an authority of the past and put forth his idea of the inhabited world – oikoumene. His notion of the earth was an oblong one, running from west to east. 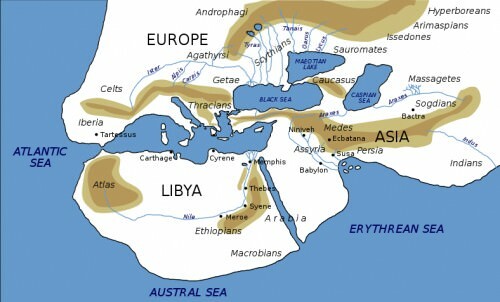 This was divided into three continents – Europe, Asia and Libya. He inform in one place in his writings that the boundaries of Europe were unknown and there was not a man who could say whether any sea girdled it round either to the north or to the east. He thought the farthest settled land in this world reached out to the Persian province of Punjab. Aristotle added that between the Pillars of Hercules (modern Gibraltar) and India there was nothing but ocean. This was the sum of knowledge when Alexander began his conquests from Macedon, the tiny kingdom in distant Greece. With all the details given by the advanced parties through marches before the great expedition began across Europe, Alexander believed India to be a peninsula of no great depth, which just jutted eastward to the sea, and which on its northern flank was bordered by the chain of mountains. North of this, at no great distance beyond the River Jaxartes was the ocean. To Alexander India meant the land of the Indus River. Whether that mighty river was the source of the Nile or whether it flowed into the ocean was beyond his interest. He must have questioned the local interpreters on arrival with his vast army on the other side of the Indus. Most of the local people did not even know the meaning of the term ocean. Ptolemy (AD 90–168) was a Roman citizen of Egypt who wrote in Greek. He was a mathematician, astronomer, geographer, astrologer, and poet. His second book is the Geography, which is a thorough discussion of the geographic knowledge of the Greco-Roman world. In it he says that the true shape of India, the most striking feature of the land, is the acute angle formed by the meeting of the two coasts of the peninsula in a single coastline running almost straight from the mouth of the Indus to the mouth of the Ganga River. Xuanzang (Hsüan-tsang AD 602 – 664) was a famous Chinese Buddhist monk, scholar, traveller, and translator who described the interaction between China and India in the early Tang period. The same division of five provinces – Five Indies – continue in his description of the land he travelled. He packs together the shape of India to a half moon with the diameter or broad side to the north and the narrow end to the south. This is not unlike the configuration of India in Ptolemy’s Geography; yet much more accurate. In fact the Chinese pilgrim author brings in a touch of humour when he says rather wryly that the people’s faces are the same shape as the country – narrow downward and broad on the top. Alexander Cunningham. The Ancient Geography of India. Adamant Media Corporation, 2003.